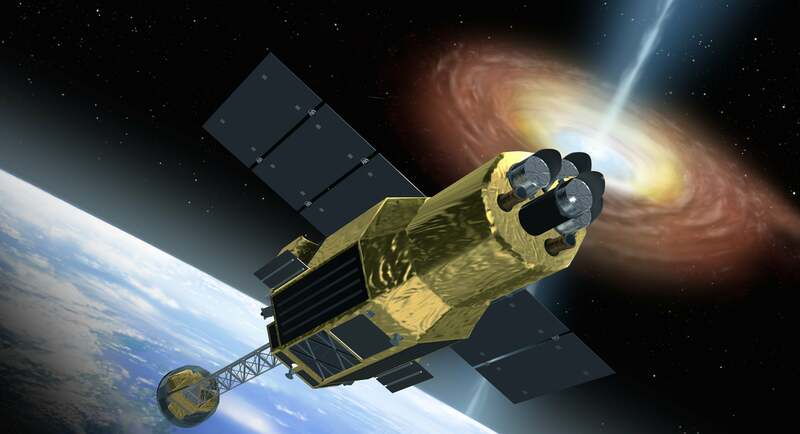 After a full month spinning out of control in space, Japan's Space Agency has finally figured out how it lost control of Hitomi, a very expensive satellite that was hunting for black holes. This also means the agency will never get it back. JAXA announced today that it has exhausted all efforts at getting Hitomi back and will leave the $US273 million ($357 million) satellite — which it had previously described as key to unlocking the mysteries of the universe — to drift off into space. Although the agency will never get Hitomi back, it does, at long last, have an explanation for just what it was that caused the problems for the highly-anticipated satellite almost immediately after it was launched. The source of the trouble was Hitomi's solar array panels, which broke off and sent the satellite spiralling out of control. More on that in a second. Hitomi had barely clocked a month in space before signs that something had gone wrong emerged. First, debris was spotted around the satellite. Then, attempts at contacting Hitomi were met with an eerie silence. Soon enough, JAXA researchers spotted the satellite spinning wildly out of control. Even then, the agency believed it might find a way to get the black hole-monitoring satellite back on track. When the satellite re-emerged and sent some strange, terse messages back to JAXA, the researchers hoped it was a sign that the damage was relatively minor. Short and cryptic as they were, the mere fact that Hitomi had sent messages gave researchers hope that it could still be recovered. Now, JAXA has not only given up hope of ever retrieving the lost satellite, but it also doubts whether it actually received any messages from the crippled Hitomi at all. Researchers inspected the messages much more closely and have noticed something odd. All the messages seemed to come from slightly different frequencies. While the agency had initially blamed damage for the nonsensical dispatches, it now looks like the real reason is that the "messages" were never from Hitomi at all. They were probably just the result of intercepted radio interference. On the bright side, JAXA thinks it finally knows what smashed Hitomi off course. It wasn't a collision with debris or a malfunctioning thruster, as had been speculated. Instead, Hitomi's solar array panels caused the trouble. The panels on both sides broke away at their bases (potentially explaining some of that debris that was spotted around the satellite immediately after it began having problems). Not only did this leave Hitomi rotating erratically, it also killed one of its primary power sources, making the possibility of getting it back on track all the more difficult. Of course, exactly how and why those panels broke off still remains a mystery. Now that it has given up all hope of ever retrieving the satellite, JAXA says it is going to focus on solving that mystery, so that the next one doesn't drift away from us, spinning alone into space.